An octagon window provides unique character and charm to any room. Installing an octagon window is a great way to add some character to a room. Moreover, it also provides a portal for letting in additional natural light and fresh air. Installing an octagon window is easy to do, and is done very similar to a standard window. A miter saw comes in handy,however, when installing an octagon window, and particularly so for the trim pieces. When installing an octagon window, you need to know a bit more than the actual octagon window measurements. You also need to know the size of the rough opening at the installation site for the octagon window. Measuring octagon windows and installing an octagon window may seem complicated, but it’s really not. Also, the box/packaging the window comes in typically states the rough window opening size requirements. For measuring an octagon window, and determining its rough opening it’s simply involves determining the length and width for the opening. Typically you want to add another two inches to the exact octagon window measurements to allow for about one inch of play on opposite sides of the window when installing the octagon window into the rough window opening. This “play” allows you to center the window appropriately. The simplest way to think about framing out an opening for installing an octagon window is to initially install a square frame for the window opening, sandwiched in between the existing wall studs. Depending upon where the window is being installed, however, you may need to cut away a section of an existing wall stud. Due to the fact that the octagon window is so small and light, the need for installing king and jack studs is usually unnecessary. King studs may be necessary, however, just due to the fact that the vertical location of the octagon window will necessitate having to install some appropriately located and spaced wall studs. See this article on the details of framing a window opening. After installing the vertical wall studs, next install the window sill plate. The sill plate is the surface area where the window sits on. The sill plate normally rests on short jack studs that are sistered to the king studs. Trimmer studs normally sit on top of the sill plate (and again are sistered to the king studs), followed by a header plate that sits on top of the trimmer studs. Cripple studs are then installed over the header plate to complete the basic window frame. Finally, four additional trimmer studs need to be installed at 45 degree angles in all four corners of the window frame to complete the installation of the rough octagon window frame opening. If the octagon window installation project is a retrofit, you can then cut away the sheathing and house siding within the confines of the window frame area to create the opening for installing the window. If the octagon window installation is new, then you can simply install the window into the side of the home. However make sure to first install ice and water shield around the window frame opening. When actually installing the octagon window, make sure the window is square and level and centered in the window frame opening. Then secure it to the exterior of the house with nails fastened into the nailing tabs located on the outside of the window. Next apply ice and water shield membrane over the window nailing tabs, and then install the necessary house siding and/or trim to the exterior of the home. 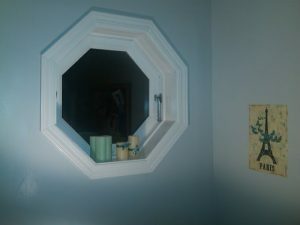 Similarly, after the drywall has been installed around the interior of the newly installed octagon window, install the window hardware and the interior trim to wrap up the project. Learn how to install drywall here. If you need more help on choosing the right window replacement for your home, contact one of our pre-screened window installation contractors. They can help you select the replacement windows that are right for your home and budget, and perform the installation. See the Installing a New Window Ebook from HomeAdditionPlus.com. 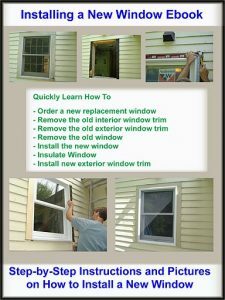 The Installing a New Window Ebook provides easy to understand, step-by-step instructions, on how to remove an old window and install a new one. Pictures are included for every key step in the process. 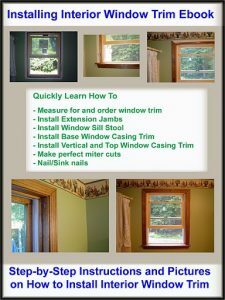 See the Installing Interior Window Trim Ebook from HomeAdditionPlus.com. The Installing Interior Window Trim Ebook provides easy to understand, step-by-step instructions, on how to install interior window trim around a window. Pictures are included for every key step in the process. Get Free Window Price Quotes, No Obligation! Fill out our 3-5 minute quick and easy form, and receive a free price quote on windows from one of our prescreened and licensed window contractors. This process is free and there is no obligation to continue once you receive your window replacement price estimate.